A diverse panel and special guests discuss cloud infrastructure, distributed systems, microservices, Kubernetes, Docker…oh and also Go! This show records LIVE every Thursday at 3pm US Eastern. A diverse panel and special guests discuss cloud infrastructure, distributed systems, microservices, Kubernetes, Docker…oh and also Go! Panelists Mat Ryer, Johnny Boursiquot, Jaana B. Dogan, and Mark Bates discuss how humans build machine to machine integrations via APIs — the good, the bad, and the ugly — and how to give yourself the best chance of success. We’re back! Panelists Mat Ryer, Johnny Boursiquot, Jaana B. Dogan, and Mark Bates discuss Go 2, the future of Go, what they like and don’t like, and what they would add or remove. 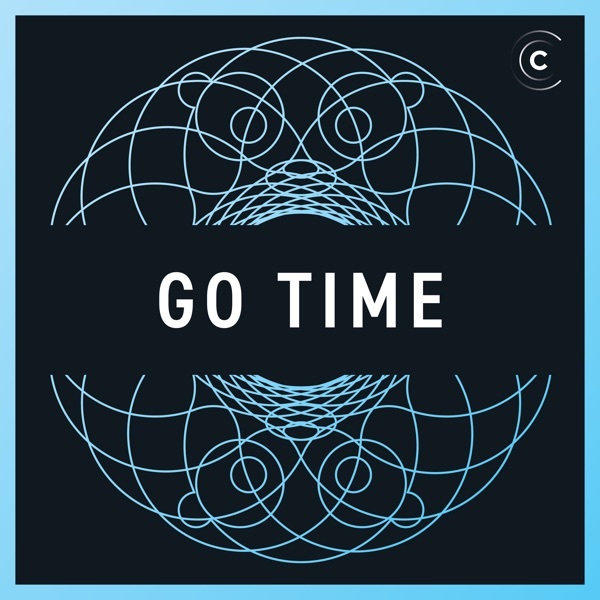 This is a bonus segment in the after show of Go Time #77 with Russ Cox where we talk briefly about WebAssembly (Wasm) support in Go, and how that plays into Go being used as a web language. Russ Cox joins us this week to talk about how Russ got involved with Go, Vgo, error handling, updates on Go 2.0, more. Matt Jaffee joined the show and talked with us about Pilosa, building distributed index with Go, and other interesting projects and news. Florin Pățan joined the show and talked with us about GoLand, the pros and cons of using an IDE, his thoughts on the Go community, and managing Gopher Slack. Jon Calhoun joined the show and talked with us about Gophercises, experiencing the joy of building cool things, creating content for Gophers, and other interesting projects and news. Andrei Matei joined the show and talked with us about CockroachDB (and why it’s easier to use than any RDBMS), distributed databases with Go, tracing, and other interesting projects and news. Bill Kennedy joined the show and talked with Carlisia about learning Go, teaching Go (which is something we’ll do at some point or another), making good presentations, and other interesting projects and news. Leo Kalneus joined the show and talked with us about GopherCon Russia and the Go community in Russia. We also debunked a few myths about Siberia and of course talked about interesting Go projects and news. Cassandra Salisbury (the Go core team’s newest member) joined Carlisia (who’s hosting all by herself) to talk about getting to know the Go community around the world, organizing meetups, empowering leaders, and what’s in store for the future. Damian Gryski joined the show and talked with us about perfbook, performance profiling, reading white papers for fun, fuzzing, and other interesting projects and news. Vitor De Mario joined the show and talked with us about hacking genetics with Go, GopherCon Brazil, machine learning, and other interesting projects and news. Paul Dix joined the show and talked with us about InfluxDB, building a company with OSS, improving the language, and other interesting projects and news. Adam and Jerod jumped in as hosts for an experiment in quantum podcasting, letting Erik and Brian play guests to talk about Virtual Kubelet, building OSS at Microsoft, BBQ (of course), and other interesting projects and news. Jeff Lindsay joined the show to talk about workflow automation, designing apis, and building the society we want to live in…plus a surprise special announcement! Jason Keene and Andrew Poydence joined the show to talk about Loggregator, scaling with Go at Pivotal, Diodes, and other interesting Go projects and news. Why WADL When You Can Swagger? Ivan Porto Carrero joined the show to talk about generating documentation (with Swagger), pks, kubo, and other interesting Go projects and news. Michael Stapelberg joined the show to talk about window management, open sourcing infrastructure, error handling, and other interesting Go projects and news. Dmitri Shuralyov joined the show to talk about being a full time contributor to open source, developing developer tools, and other interesting Go projects and news. Cindy Sridharan joined the show to talk about development and operations as a generalist, leveling up as an engineer (while still providing business value), challenging the status-quo, and other interesting Go projects and news. Carolyn Van Slyck joined the show to talk about dependency management, upping your cross-platform game, getting into Go, and other interesting Go projects and news. Chase Adams joined the show to talk about working on distributed systems with distributed teams, giving people opportunities to learn and grow, and other interesting Go projects and news. After taking some time to recover, the gang rehashes all the greatest talks and favorite moments from this year’s GopherCon. Much love to the Go community and all the souls who worked tirelessly to make this conference happen. Aaron Hnatiw joined the show to talk about being a security researcher, teaching application security with Go, and a deep dive on how engineers and developers can get started with infosec. Plus: white hat, black hat, red team, blue team…Aaron sorts it all out for us. Kris Nova joined the show to talk about developer empathy, running K8s on Azure, Kops, Draft, editors, containerizing odd things…and what it’s like to play a keytar. Ramya Achutha Rao joined the show to talk about all the things that make VS Code a great editor for writing Go, getting help from the community, plus other interesting Go projects and news. Alexander Neumann joined the show to talk about using Go to write backup software, solving tough problems like deduplication, scratching your own itch, and other interesting Go projects and news. Solomon Hykes joined the show to talk about all things Docker, Moby Project, and what makes Go a good fit for container management. Marc-Antoine Ruel joined the show for a deep dive on controlling hardware, writing drivers with Go, and other interesting Go projects and news. SPECIAL — Ask Us Anything! This is a special “Ask Us Anything” episode where we answered questions submitted by the community — covering everything from impostor syndrome and the future of Go, to the music we listen to to get in a groove, and barbecue (of course). Brad Fitzpatrick joined the show to talk about becoming the face of open source Go, getting the community involved in bug triage, the potential future of Go, and other interesting Go projects and news. Ashley McNamara joined the show to talk about sharing developer experiences, seeking help from the community, getting people excited about STEM, and other interesting Go projects and news. Kavya Joshi joined the show to talk about shipping production-grade Go, writing firmware with Go, making complex technical concepts accessible, and other interesting Go projects and news. Wally Quevedo joined the show to talk processing millions of messages per second with Go, writing network clients, performance at scale, and other interesting Go projects and news. Luna Duclos joined the show to talk about rebuilding a microservice infrastructure with Go, game development, and other interesting Go projects and news. Matt Aimonetti joined the show to talk about using go to solve tough audio problems, making go for everyone, empowering people with software, and other interesting Go projects and news. Steve Francia joined the show to talk about the results of the 2016 Go Developer Survey and other interesting Go projects and news. Ron Evans joined the show to talk about Gobot, writing software for hardware, and open source software’s role in improving the human condition. Sam Boyer joined the show to talk about dependency management, building community consensus, and other interesting Go projects and news. Charity Majors joined the show to talk about debugging complex systems, using go to save one’s sanity, hiring smart people who can learn, and collectively working to make “on-call” life not miserable. Joe Doliner joined the show to talk about managing data lakes with Pachyderm, data containers, provenance, and other interesting Go projects and news. Mat Ryer joined the show to talk about creating your own Gopher avatar with Gopherize.me, the importance of GitHub Stars, his project BitBar, and other interesting Go projects and news. Special thanks to Kelsey Hightower for guest hosting too! Filippo Valsorda joined the show to talk about his project Hellogopher, whosthere (whoami.filippo.io), $GOPATH, TLS 1.3, Cloudflare’s secret reverse proxy, and more. Travis Jeffery joined the show to talk about Go, Jocko, Kafka, how Kafka’s storage internals work, and interesting Go projects and news. Johnny Boursiquot and Bill Kennedy joined the show with Erik and Carlisia to talk about a hard subject — Imposter Syndrome. Not often enough do we get to have open conversations about the eventual inadequacies we all face at some point in our career; some more often than others. You are !imposter. Mark Bates joined the show this week live from his local Dunkin’ Donuts to talk about Go and Buffalo — his Go web framework. Those who listened live said this was our best show yet. If you agree let us know in #gotimefm on Gopher Slack or say hi on Twitter. Thorsten Ball joined the show to talk about creating a programming language, writing an interpreter, why he wrote the book “Writing An Interpreter in Go”, how writing a language/interpreter will help you better understand other programming languages, building a computer from Nand to Tetris, and his thoughts on imposter syndrome. Keith Randall from the Go team joined the show to talk about why a new compiler, what we gain from SSA, what’s next for the compiler, Go 1.8, and the goals/plans for Go 1.9. Nate Finch joined the show this week to talk about Juju, Charms, maturing a project along side Go, Gorram, finding your happy path, and more. Tess Rinearson joined the show to talk about Chain launching their open source developer platform, choosing an open source license, open sourcing Chain Core, and the future of this powerful blockchain written in Go. Jaana B. Dogan joined the show to talk about hardware geekery, on-boarding people into Go, the state of the feedback loop with the Go team, and her initiative to create Go Work Groups. Blake Mizerany joined the show to talk about coming to Go from Ruby, Go’s growth and adoption over the past 7 years, adopting external dependencies, building a startup on Go, and coding as CEO. Kelsey Hightower joined the show to talk about the work he’s doing at Google Cloud Platform, Kubernetes, Bringing Pokémon GO to life on Google Cloud, Kubernetes cluster federation, Containers, and of course Go. Katrina Owen joined the show to explore ideas about open source, code review, learning to program, becoming a savvy programmer, mentoring, projects she’s working on, and also her very prominent and amazing code learning tool Exercism. Aaron Schlesinger joined the show this week to talk about his Go in 5 Minutes series of screencasts, and design patterns in Go. Dave Cheney joined the show this week to discuss SOLID Go design, software design in Go, what it means to write “good Go code”, and error handling. This episode wins the contest for the most protocols discussed. Matt Holt joined the show to to talk about TLS, Let’s Encrypt, the ACME protocol, CaddyServer, and a host of other important information security issues. In our first show after GopherCon, we are joined by Francesc Campoy to chat about some of our GopherCon experience, understanding nil, and a great variety of interesting topics of interest to the Go community. Jessie Frazelle joins us this week to talk about being an open source maintainer, Docker’s pull request acceptance workflow, dotfiles, getting started with public speaking. Ed Muller from Heroku join us to discuss his State of Go survey, vendoring and versioning, the Heroku Go Buildpack, how they use Go at Heroku, and more. Scott Mansfield joins us this week to talk about Go at Netflix, performance, latency and caching, Rend (their memcached proxy), chaos monkey, and more. A deep dive into goa, a design-based microservice framework with a DSL that generates idiomatic Go code for your APIs, swagger documentation, and tests helpers. A deep dive into the fascinating topic of mechanical sympathy with Bill Kennedy. We talk about that plus CPU caches, how object oriented programming is not oriented to be sympathetic to the hardware, and data-oriented design. On this show we’re joined by Sarah Adams. We talk about creating safe spaces for women to get started in the Go community, about Women Who Go, and take a deep dive into her Test2Doc open source project. Travis Reeder joins the show today to talk about Iron.io, early Go adoption, how Iron.io helps with GoSF and other events for the Go community, the implications of containers at scale, and more. Cory LaNou is our guest this week. He shared what it was like to start open source development after 13 years of programming behind closed doors, and what it was like to have one of his first contributions (a bug fix) be reviewed by Dave Cheney (a very prominent Go developer). Cory helps to organize several local meetups and shared the details of his work in the community, as well as some inspiring tips for how to get involved. We also discussed the need for domain knowledge to understand the code you’re reading, microservices and frameworks in Go, reasoning for breaking down an application, performance, and more. In this inaugural show Erik, Brian, and Carlisia kick things off by sharing some recent Go news that caught their attention, what to expect from this show, ways to get in touch, and more.